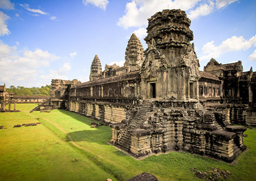 With a nine day tour, you will discover from the one of the world's most magnificent sights Angkor complex to its pristine coastline in the south west. 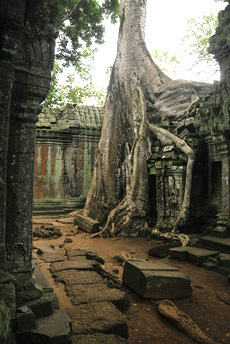 Head from Siem Reap, a mind-blowing experience with seeing the Angkor Wat, perfection in stone; Angkor Thom, a wealth of temples and its epic proportions, Ta Prohm with iconic tree roots strangling the surviving stones; Banteay Srei, the art gallery of Angkor. 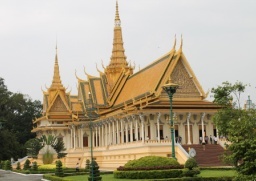 You will visit the stunning cononial Phnom Penh city before continuing to South coast where remains practically deserted save for a clutch of fabulously diverse coastal town: Kep, the faded monarch; Kampot, the suave French colonialist and Sihanoukville, the brash temptress. 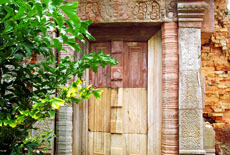 Upon arrival in Siem Reap, you will be welcomed by our guide and transfer to the hotel. Your room is availble after 14:00 p.m. Free time to explore charming city. Overnight at the hotel in Siem Reap. Early morning, we enjoy the Tuk Tuk to the jungle-covered temple of Ta Prohm and come back to hotel for breakfast at 07:30. Breakfast at hotel, then drive to Bokor National Park; a pleasant 30 minutes forest walk will take you to the Popokvil Waterfalls. Access is difficult during the wet season and there may be no water in the dry season - however, the walk is pleasant at any time! Visit the long abandoned hill station of Bokor Mountain: discover the ruins of the former Royal Residence, the church, the casino hotel and (weather permitting) enjoy an amazing view of the southern coast. Picnic lunch provided at the site. 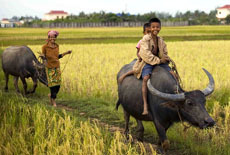 About twenty kilometers from the Vietnamese border, there locates the resort of Kep and Kampot. 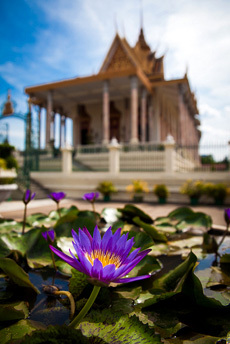 Lesser-known and quieter than LA Station Sihanoukville, however, Kep and Kampot will offer tourists wonderful experiences with beautiful beaches, colonial charms and tranquility. Kep is a seaside resort located on the south coast of the country. Unlike Sihanoukville beaches, beaches in this area are all covered with black sand. This small town is peaceful and fascinating, offering diverse sceneries for tourists to enjoy. Near Kep, about 14 kilometers to the southwest of the city, it is interesting to visit Phnom Sar Sear. It is a mountain whose name was originated from a Khmer legend when Prince Sakor Reach led the troops to this place, he got off his horse and moved furtively ahead of his pursuers along the mountainside, where at that time there was an island to which he fled. 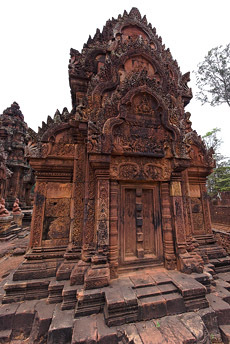 Phnom Sar Sear is composed of three small mountains about 1.5 square kilometers. It is about 40 meters high. The site features two natural caves-Phnom Dorei Sar and Phnom Ach Prochiev-which tourists can explore. At the foot of the mountain are a number of small halls where clergymen and nuns meditate. 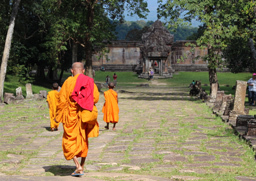 Along the way to the mountaintop, there is a Buddhist pagoda where monks live. On the mountaintop sits a colorful, finely sculpted stupa built in 1964 by Prince Rasmei Sophoan. 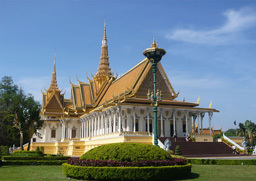 A place of worship, it also houses a Buddha relic. 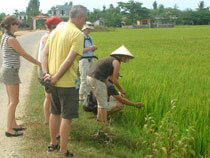 Kampot is a charming seaside resort which has been neglected because of political issues for a long time. Now, the destination is attracting new tourists who highly appreciate its setting. The old French villas are still there and create a special atmosphere to this small town. Furthermore, you also can visit the beautiful limestone caves, which may remind you of Halong Bay in Vietnam. Sihanoukville draws huge crowd for its secluded beaches and islands. 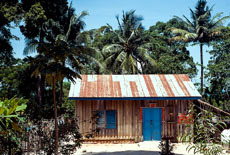 A small archipelago is embedded by the Sihanoukville Bahia off its south and west coast. Beaches that line the west contour of the city from north to south are Victory Beach, Lamherkay Beach, Koh Pos Beach, Independence Beach, Sokha Beach, Serendipity Beach, Ochheuteal Beach and many others. 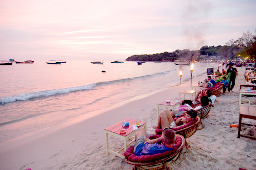 The most popular beaches are Ochheuteal, Sokha, Independence and Victory. Tourists can take water taxis to the nearby islands for diving, snorkeling and game fishing.